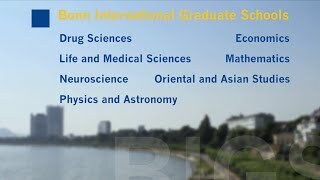 The Bonn International Graduate School - Oriental and Asian Studies (BIGS-OAS) is one of seven International Graduate Schools of the University of Bonn and the only one within the Faculty of Arts. The Bonn International Graduate School – Oriental and Asian Studies investigates the cultures and societies of Asia and the Middle East in change through time and processes of global interaction. The graduate school combines the broad regional and thematic scope of the University of Bonn's Oriental and Asian based social sciences and humanities. Furthermore, the graduate school is embedded in existing research structures and is part of an international network of partner institutions. In close cooperation with involved research networks the graduate school integrates theoretical and methodological approaches for text research, cultural and social sciences, and explores new approaches to enable a fruitful research environment for Asian studies. The graduate school aims to provide young scholars at an early stage of their research with an interdisciplinary and innovative research environment, that will facilitate a creative working atmosphere for doctoral students to independently analyze their research questions. Dissertation projects are not restricted to a certain subject or theme, rather the graduate school promotes projects that are in line with the institutes focus. The doctoral students develop their project in close cooperation with their advisor and associated researchers. Participants usually do not join the program with a finished project plan, instead the first year of studies is designed for participants to formulate an adequate topic. The doctoral students are incorporated into the graduate school's framework of a structured doctoral program, that will lead to a completion of their PhD within four years. The curriculum encourages their theoretical, methodological, and occupational competencies and prepares them for a competent participation in the international research community. As a rule, research and field studies abroad are integrated into the second or third year of the graduate program. A special emphasis is laid on the intensive support of the individual doctoral projects by the advisor (from the field of subject) and as well from discussions and research colloquia that are offered by the graduate school. A further important concern of the graduate school is to actively support the doctoral students in receiving research grants and funds. The BIGS-OAS annually accepts 15 new doctoral candidates; the academic year starts on October 1st. The duration of the program is four years (five years after a B.A. degree). In October 2014 we established an additional International Peer Group that responds to the specific needs of international non-German-speaking PhD students. All information regarding BIGS-OAS, our program, the application process, contact etc. can also be found on our English website.